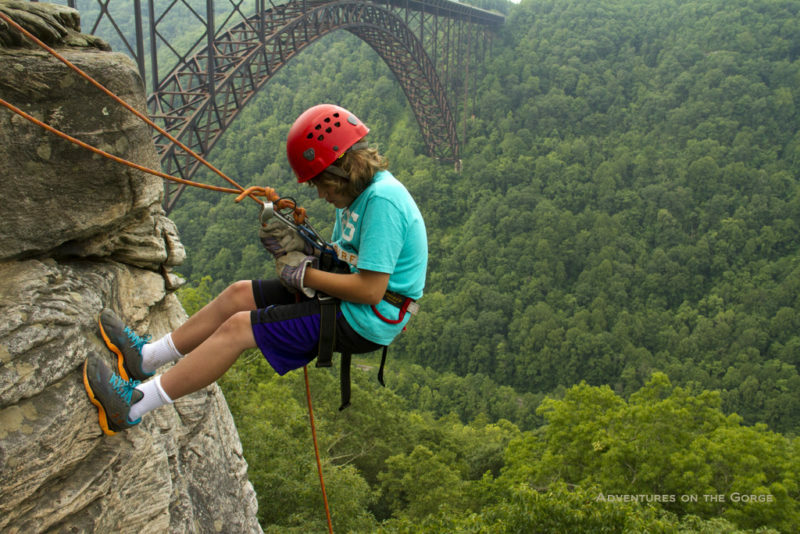 A young climber scales the cliffs along the New River Gorge. Photo courtesy Adventures on the Gorge. The National Park Service will host a meeting on rules and regulations for climbing activities at New River Gorge National River and Gauley River National Recreation Area on March 16 from 5:30-7:30 p.m. at the Canyon Rim Visitor Center near Fayetteville, West Virginia. The meeting follows a successful climbing listening session and community meeting held in the fall, according to Julena Campbell, Public Affairs Officer for the three areas of national park in southern West Virginia. “The purpose of this meeting will be to explain park rules and regulations and how they apply to climbing activities in the park so that visitors partaking in climbing activities have a better understanding of what is and is not allowed,” Campbell said in a press release. More than 1,600 climbing routes have been established high above the New River in the New River Gorge National River, making the park one of the largest climbing areas in the eastern U.S., Campbell said. The extensive cliff that rims much of the western portion of the gorge is composed of Nuttall Sandstone, which is renowned among rock climbers. Since the establishment of the national river in 1978, the area’s popularity has blossomed to become one of America’s premier climbing destinations. Attendees who require additional information or special assistance to attend and participate in this meeting should contact Chief Ranger, Duane Michael at 304-465-6518 or via email at ronald_michael@nps.gov prior to March 15, 2018. Information about climbing at New River Gorge National River can be found at the park service website. The Canyon Rim Visitor Center is open seven days a week, 9:00 a.m. to 5:00 p.m.
West Virginia is among the most popular and highly rated rock climbing destinations in the eastern U.S. Climbing areas feature stupendous scenery and challenging sports and traditional climbs. Warm winter days are common, so climbing may be enjoyed year-round.